"Don't bet your life on riding out a monster," North Carolina's governor warned to residents who were considering ignoring the evacuation. With a mandatory evacuation in place, residents, businesses and utilities in North Carolina's low-lying barrier islands are bracing for a potentially historic impact from Hurricane Florence. "We're definitely preparing for the worst, which would be a system-wide outage," said Laura Ertle, director of public relations for Cape Hatteras Electric Cooperative, the utility that serves all 7,500 customers on Hatteras Island, a resort-dotted strip of land off the North Carolina coast. "Our messaging to our members is just safety: We want them to heed those evacuation orders," she said. On Tuesday, North Carolina's Gov. Roy Cooper ordered what he called a "first-of-its-kind" mandatory evacuation for the vulnerable barrier islands, adding that typically local governments are the ones to issue evacuation orders. Most coastal communities already had evacuation orders in place. Cooper said his state order was in addition to those because Florence — currently a Category 4 hurricane slated to make landfall along the coast of North Carolina or South Carolina on Friday — is "so fierce," residents need added incentive to leave. "Even if you’ve ridden out storms before, this one is different. Don't bet your life on riding out this monster," Cooper warned during a press conference. 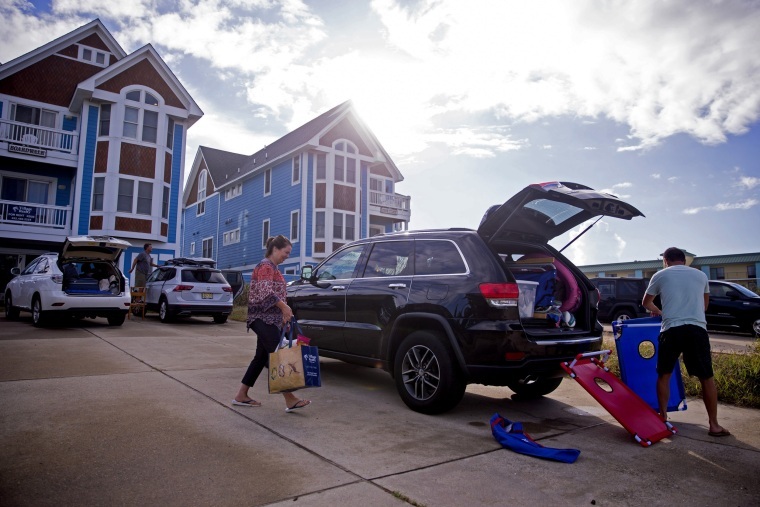 In the Outer Banks, a series of barrier islands off North Carolina's coast, many residents were already in the process of evacuating and businesses were being boarded up. Megan Turner, a recreation associate for Kitty Hawk Kites in Nags Head, N.C., said the stores at her company, which has multiple locations throughout the barrier islands, were closing today. "This is the first major hurricane I've experienced," Turner, who has been living in the area for two years, said. "I'm planning on leaving to go inland." And Robin Mann, who along with her husband owns Mann Custom Boats on Manns Harbor, N.C., said 75 percent of their employees had already evacuated as of Tuesday morning. "The flooding is what most people are worried about," she said. "We are very busy right now, so this is kind of interrupting our business." But not everyone was heeding the warning. Pam and Matt Landrum, who have owned Roanoke Island Outfitters and Dive Center in Manteo, N.C., said the couple never evacuates. "We plan for the worst and hope for the best," Landrum said. "It's always worse inland ... They lose power." Utility companies feared the barrier islands would be in the dark, too — possibly for weeks. "We already anticipate the aftermath of the storm to being minimally looking at two weeks until we get to full power restoration." "We already anticipate the aftermath of the storm to being minimally looking at two weeks until we get to full power restoration," said Heidi Smith, corporate communications manager for Tideland Electric, the utility for Ocracoke Island's 22,600 residents. The Federal Emergency Management Agency anticipates "massive damage" to the Carolinas and Virginia region, said FEMA’s associate administrator for response and recovery, Jeffrey Byard, said at a press conference on Tuesday. If it maintains its strength, Florence won't be the first Category 4 hurricane to make landfall on North Carolina's coast: In October 1954, Hurricane Hazel hit at the same strength, but on the state's southeast coast, south of the Outer Banks. The fast-moving storm, which killed hundreds of people in Haiti, tore through North Carolina and killed 19 people before continuing up north and killing dozens more in the U.S. and Canada. Hazel was responsible for 95 deaths in the U.S. and 100 deaths in Canada, according to the National Weather Service. But hurricane historian Jay Barnes, author of "North Carolina's Hurricane History," pointed out that the coast was significantly less populous at that time. "With Hurricane Hazel, the beach was not viewed as a place to live. It was more of a summer retreat, so a lot of the houses that were swept off their foundations, they were all empty," he said. While the Outer Banks are out of their busy summer tourist season, the islands are in the midst of a second, smaller season that lasts through Thanksgiving, said Karen Brown, president and CEO of the Outer Banks Chamber of Commerce. "So we have had a lot of visitors this week, and we watched of all of them leave yesterday," she said. But, Brown added, "I have learned that the Outer Banks community is very resilient. They'll stare down a storm bigger than anything. So hopefully that will bode well for us."